Maryland may be small, but it has a lot to offer prospective college students. Maryland is home to over 50 colleges, 30 public and 23 private. Maryland’s state government has also been part of growing nationwide legislation aimed at providing no-cost college education to its residents. But while details and outcomes are still unclear, prospective Maryland college students are still responsible for researching which colleges provide the highest-quality, most affordable education online themselves. We’ve outlined the details on the best online colleges in Maryland, and answered tough questions on tuition costs, financial aid and transfer credits for Maryland students below. Online universities in Maryland offer a variety of programs, including technical fields, hospitality, nursing and science. But before students can choose a specific college or program, they should look for an accredited online university that offers their specific program, has a good reputation, and charges an affordable rate. 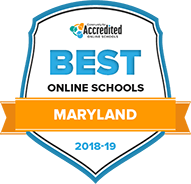 Take a look at our picks for the top online colleges for providing quality and fostering student success in Maryland. Though Towson University does offer an online bachelor's completion program in allied health, distance learning really shines at the graduate level. Certificates and master's degrees are offered in a range of disciplines, such as autism studies, information technology, human resources, occupational science, nursing and media, all delivered through the Blackboard learning platform. To ensure online students face the same rigorous education as their campus counterparts, Towson University offers the Online Edge Program to assist instructors in honing their skills in online education. Students at University of Maryland-College Park can choose from a variety of online options, especially at the graduate level. Graduate certificates and master's degrees in engineering, library science, public health, nursing and entomology are just a few examples of available programs. One of the most popular options is the online MBA, which allows students to save money by taking certain courses through EdX that are then transferrable to the graduate program. Students pursuing online programs at University of Maryland-College Park can expect the same in-depth education their campus counterparts receive, as well as the use of many student services. McDaniel College is a private liberal arts school that offers fully online and hybrid distance learning programs for graduate students. With both master's degree and certification programs, McDaniel features a wide range of specific options that focus on the education field. As a distance learner, you can earn master's degrees and certificates that prepare you for careers in education and schools, such as the MS programs in school librarianship, educational leadership, TESOL, and curriculum instruction. Available certificates in this area include disability services in higher education, school administration, learning technologies specialist, and equity and excellence in education. Graduate students may transfer up to six credits from other accredited programs with the approval of the admissions office. Johns Hopkins University in Baltimore is a private research institution founded in 1876. For undergraduates, Johns Hopkins has four standout degrees in computer science, electrical and computer engineering, mechanical engineering, and environmental engineering. These degrees teach a quantitative, data-driven approach to research, and help students seek out cross-disciplinary approaches to problem-solving. Since engineering and computer science have prominent roles at Johns Hopkins, many of these degrees are also offered at the master's and doctoral level. Additional traditional degree programs, such as physics, molecular biology, business administration, and education are also available online at the graduate level. Courses are mostly taught in an asynchronous format, allowing you maximum scheduling flexibility as you work toward your degree. If you wish to transfer to Johns Hopkins, you must have completed at least 12 college credits. Established in 1966, the University of Maryland-Baltimore County is a public research institution with four online master's degrees and three post-baccalaureate certificates. These distance learning programs, in the fields of education, emergency health, information systems, and instructional systems development, offer cutting-edge training over the course of three to four years for master's students, and one year for certificate seekers. As one of the most established graduate programs at UMBC, the instructional systems development program produces technically-trained professionals who go on to careers at places like IBM, the National Security Agency, T. Rowe Price, research hospitals, and many others. Stevenson University is a private, independent institution established in 1947. Distance learners can choose from a wide variety of undergraduate and graduate programs, including popular programs in investigative sciences and legal studies. As an online student, you can earn a master's degree in crime scene investigation, cyber forensics, digital forensics, and forensic science. Undergraduates can work toward degrees in this field, too, with bachelor's degrees in criminal justice, digital forensics, and legal studies. As an added feature, Stevenson offers associate to bachelor's programs in nursing and a bachelor's to master's options in several fields. With these programs, you can earn both degrees and save time and money on multiple courses. The majority of these degree requirements can be completed online, with only a few tracks requiring on campus obligations. Tuition reductions are available for students pursuing their degrees through one of Stevenson's partnerships. These partners are on a predetermined list, located on the online homepage, of community colleges, healthcare organizations, and employers in the region that help adult students earn their degrees. The University of Maryland-University College in Adelphi is a public, not-for-profit institution with on 90 online programs and specializations. Among the undergraduate and graduate degrees, as well as certificate offerings, UMUC's multiple degrees in information technology and cybersecurity are star programs. In addition to preparing students for in-demand careers in growing fields, you will be prepared to sit for various certification exams with security industry leaders such as the Disaster Recovery Institute, Project Management Professional, and CompTIA Security. Undergraduates may transfer up to 90 credits from colleges and universities, and up to 70 credits from community colleges. Master's students may transfer a maximum of six credits toward their degrees, while certificate seekers are limited to three credits. Out-of-state students pay higher tuition than in-state students, but a significant military discount is available for eligible distance learners. Frostburg State University offers both fully online and hybrid courses at the undergraduate and graduate levels. FSU's RN to BSN nursing degree prepares students with online classes coupled with some hands-on, supervised training at facilities near the student. Additional online degrees are at the master's level, in business administration, recreation and parks management, applied computer science, and special education. Incoming freshman can get a jumpstart on their degrees by opting into Frostburg's summer online freshman initiative. Before your first fall semester, you can take introductory and required courses online to start making headway toward your degree. Capitol Technology University is a private nonprofit school that offers online degree programs in flexible synchronous and hybrid formats. While the majority of degrees at Capitol are graduate level, distance learners can earn Bachelor of Science degrees in business administration, cyber and information security, or management of cyber and information technology. For these undergraduate programs, your junior and senior year coursework may be completed entirely online. Online master's degrees can be completed in an accelerated format, with eight-week and 16-weeks courses, entirely online. Master's students can prepare for careers in quickly growing technological fields with degrees in computer science, cybersecurity, and cyber analytics. The majority of requirements for the Doctor of Philosophy in business analytics and decision sciences may be completed online, as well. While the cost of your online education varies per degree and specialty area, all online students pay the same tuition rates regardless of their location. How can I find which online colleges offer the degree I'm looking for in Maryland? Prospective students can find a complete list of Maryland colleges at the State of Maryland website. Most colleges in Maryland also offer a listing of online programs on their website. For example, the University of Maryland University College offers a complete list of online degree programs. Colleges that offer a wide variety of online degree programs, like Townsend University, may be a good fit for students unsure of their final career path so that students can switch between degree plans if necessary. Students can also contact an admissions adviser for more information. Which online schools in Maryland accept my transfer credits or work/life experience? Most accredited colleges and universities in Maryland accept transfer credits from other accredited schools. However, colleges accept credits from other universities on a case-by-case basis. Accreditation also influences transfer policies—almost all schools accept credits from regionally accredited colleges. Some colleges and universities also grant credit for life experience, work history, or military service. For example, the University of Maryland allows students to earn credit for exams, workforce training, vocational training and professional certificates. How Much More Do College Grads in Maryland Make? Maryland’s residents working in jobs that require a bachelor’s degree or higher can expect to make, on average, more than $50,000 per year than those which require no formal education. Those working in industries that require doctoral degrees may find themselves out-earning even master’s degree holders by nearly $35,000 per year. One of the smallest and oldest states in the nation, Maryland boasts a rich history and booming economy. Several industries need educated, skilled employees. Maryland's labor market has remained stable over the last year, and the unemployment rate sits right around the national average. In Maryland, more jobs require a bachelor’s degree than in many other states—the fastest-growing careers in Maryland are in the law, teaching and healthcare fields. Nationally, the Bureau of Labor Statistics projects that between 2016 and 2026, jobs in information security, occupational therapy and software development are also incredibly fast-growing careers, with projected growth between 10 and over 50 percent each year. With Washington, D.C. near the western region of the state, residents often choose to commute for jobs just outside Maryland’s borders. All students need to make sure their school holds proper accreditation to ensure they are receiving a high-quality college education. No matter if a student is earning an online degree or taking classes on-campus, quality should never have to be sacrificed for convenience sake, and accreditation reinforces that. To receive accreditation, colleges and universities must prove they meet certain academic and professional standards; the Maryland Higher Education Commission provides more information on accreditation in the state. Employers and graduate schools may prefer regional accreditation over national accreditation. In some cases, regional accreditation requires higher standards and a long review process. To receive regional accreditation, online colleges in Maryland must undergo review from the Middle States Commission on Higher Education. Certain departments and programs within various colleges may also receive programmatic accreditation from professional associations or other organizations. For example, the University of Maryland holds programmatic accreditation for several master's programs, including their master’s-level teaching degrees. Johns Hopkins University holds accreditation from several organizations, including the Liaison Committee on Medical Education and the Commission on Collegiate Nursing Education. Flat Online Cost: Some schools in Maryland offer a blanket cost for complete online degree programs. Morgan State University offers complete degree rates for its online degrees. Region-Based Credit Rates: There are regional discounts offered by some Maryland schools, specifically for students residing in specific counties and locations. Garret College offers special credit rates to border counties and residents of West Virginia. Military Tuition Rates: Some online schools offer discounts to military service members. The University of Maryland also extends this discount to military spouses and dependents. Maryland residents can look into a program called the Academic Common Market created by the Maryland Higher Education Commission, which allows Maryland students to pay in-state tuition costs Maryland at participating schools located outside of the state. What are Maryland's requirements to qualify for in-state university tuition? To qualify for in-state tuition, students must usually hold residency for at least 12 months. Many schools make exceptions for military students and their spouses. Candidates must prove that they permanently moved to Maryland for a purpose other than receiving in-state tuition. Each school sets unique policies, so make sure to research individual residency requirements before applying. Are online credits more affordable in Maryland than other places? Most importantly: Students should research the schools they are interested in attending to understand the complete view of fees and costs associated with earning an online degree in Maryland, which can extend beyond simple tuition. How can I get help paying for online college in Maryland? Students who attend accredited online colleges and universities in Maryland can receive financial aid from a wide variety of sources. Every student should file the Free Application for Federal Student Aid (FAFSA) to see which federal awards they will qualify for. In addition to government financial aid, students can apply for grants, loans and scholarships. There are dozens of scholarship opportunities for Maryland students, including options through the Maryland Higher Education Commission. Learners can also search for awards though the Department of Labor's Career OneStop. Students should also check with their school's financial aid office for applicable school-based scholarships for academic achievements or extraordinary life circumstances. Howard P. Rawlings Program of Educational Excellence Awards These awards include the guaranteed access grant, the 2+2 transfer grant and the educational assistance grant. Scholarships are awarded to Maryland residents attending as a full-time undergraduate student. Jack F. Tolbert Memorial Student Grant Program This grant is awarded to students attending a private career school. Students must be residents of Maryland and this is a needs-based scholarship. Senatorial Scholarship This scholarship is awarded to high school seniors. Students must be Maryland residents and must demonstrate financial need. Adult learners face different challenges when thinking about going back to earn a college degree than students coming to college right out of high school. Prospective adult students in Maryland may find a helpful resource in the Maryland Department of Labor, Licensing and Regulation, which provides adult education and learning services that can better prepare non-traditional students for the college experience. Preparing for college academically. Maryland adult education provides everything from adult high school and GED classes to courses designed for English for Speakers of Other Languages and programs to help students of all ages brush up on their basic math, grammar and reading comprehension to prepare for college coursework. Lifelong learning for seniors 55+. Older adults who are interested in earning a college degree can better prepare for lifelong learning opportunities through Maryland’s adult and continuing education programs. Transitioning to earn a college degree. Maryland offers programs to help students transition from the workforce to college, or from college to the workforce thought the PROMISE program. Transferring to a 4-year college. The Maryland Higher Education Commission offers information about how adult learners can transfer into a four-year college and between Maryland institutions. The State of Maryland offers a directory of local adult education programs to help aspiring college students get on the right track before enrolling in a degree program.